Australia has rebounded from a Test series loss with a stunning 34-run win over India in the first ODI in Sydney. On a SCG deck where 300 looked like a par score, the home side managed 5-288, capped by 73 from Peter Handscomb. 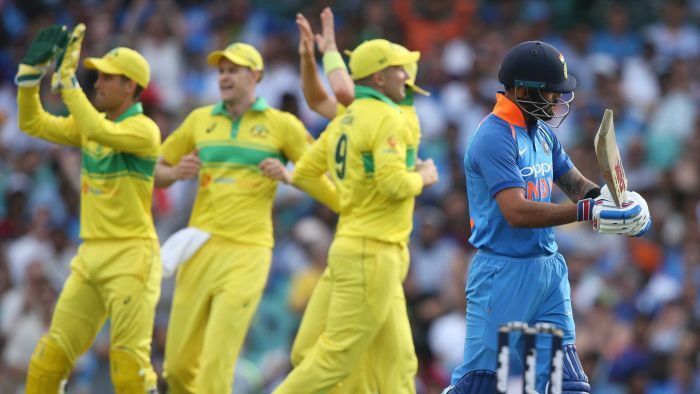 But if there were questions of whether Australia could defend its total, they were answered in a blistering four-over burst at the start of the Indian innings, when Shikhar Dhawan, Virat Kohli and Ambati Rayudu were all sent back to the pavilion to leave the tourists at 3-4. They never really recovered, although MS Dhoni and centurion Rohit Sharma did their best to get India back in the match, the team was kept to 9-254 off the 50 overs. There was controversy in the Indian innings when Dhoni was adjudged LBW to debutant Jason Behrendorff — with the tourists out of reviews — only for replays to show the ball had pitched outside leg. Australia had won the toss and opted to bat first at the SCG. The home side struggled early, with skipper Aaron Finch (6) beaten by a delivery from Bhuvneshwar Kumar in the third over which bowled him through the gate. Wicketkeeper-batsman Alex Carey was opening with Finch, and he hit a handful of boundaries before being picked up by leg-spinner Kuldeep Yadav, who struck in his first over — the innings’ 10th — with Carey (24 off 31 balls) edging a cut shot to Rohit Sharma at slip. Marsh and Khawaja took over and stayed together for nearly 20 overs, moving the score on past 100, but neither were going at a quick rate. Australia was 2-133 in the 29th over when Jadeja trapped Khawaja (59 off 81 balls) in front. Khawaja reviewed the decision, but although there was a suggestion that the ball might have been slightly going down leg side, the replay showed enough was hitting to make it an umpire’s call. Coach Langer decided against elevating Glenn Maxwell up the order, bringing in Peter Handscomb at five. The Victorian was back to his old much-criticised batting stance with his front foot just on the crease. Marsh was going mainly in singles, but he brought up his 50 with a nice pull shot off seamer Khaleel Ahmed. He and Handscomb began to put the foot down with a string of fours, but Marsh came unstuck in the 38th over when he tried to loft Kuldeep down the ground and holed out to Mohammed Shami at long-on for 54. A couple of tight overs at the right time then left Australia 4-195, with new batsman Marcus Stoinis needing to go big. The Indian bowling remained accurate, however, and the home side was still hitting ones and the occasional two as the goal of 300 began to fade from view. It took until the 44th over for Stoinis to heave Kuldeep into the upper deck over wide long-on. Later the same over Handscomb reached his 50 with a lofted drag over long-on for another maximum. He was lucky to get another six off Kumar with Ambati Rayudu palming the ball over the boundary rope, but the Indian bowler had his revenge the following ball when Handscomb was caught by Shikhar Dhawan to be out for 73 off 61 balls. Stoinis and Maxwell finished strongly with 40 runs off the last three overs, to complete the Australian innings on 5-288. Kuldeep (2-54) and Kumar (2-66) led the Indian bowling figures. The home side gave Behrendorff his first Australian ODI cap, and he had grabbed his first wicket in the opening over, trapping Dhawan plumb in front for a duck. The ball before, Australia had wasted its review on an LBW shout against Sharma — the replays showed the delivery from the Western Australian paceman was pitched outside leg and travelling high. More tight bowling from Jhye Richardson and Behrendorff (2-39) had India well behind the rate after three overs, and then the Indian innings imploded with Richardson claiming two wickets in three balls. The skipper Virat Kohli clipped Richardson off his pads straight to Stoinis to depart for 3. Then two balls later Rayudu — who was named in the starting XI after KL Rahul and Hardik Pandya were suspended by the BCCI for controversial comments in a TV interview — was given out LBW. A review confirmed a straightforward dismissal and he was on his way for a duck. Sharma and Dhoni then dug in, trying to keep their wickets intact. By the end of the powerplay at the 10-over mark, India was 3-21 and by the 13th over the tourists’ vaunted batting was going at just two runs an over. Finally, Sharma sent a Peter Siddle bouncer into the stands, and an over later Dhoni launched Nathan Lyon back over his head for a big six. The pair kept the scoreboard moving, but fell further behind the rate. Sharma made his 50 near halfway, and then began to accelerate with fours and sixes. Dhoni followed, but his controversial dismissal for 51 came soon after, ending a 137-run partnership. Sharma was joined by Dinesh Karthik (12 off 21) as he tried to keep the team in the game. When Karthik fell in the 40th over, India needed 113 runs to win, and only a huge century from Sharma could make it possible. The Indian opener kept hitting sixes off Lyon and Stoinis, but he was running out of partners. Ravindra Jadeja (8) became Richardson’s fourth victim when he was caught at deep backward point, and then Sharma finally fell, holing out to Stoinis for 133 off 129 balls. The game petered out to an easy Australian win, with Siddle getting amongst the wickets with the late scalp of Kuldeep Yadav (3) and Mohammed Shami holing out off Stoinis off the last ball. The second game in the three-match series will be held at Adelaide Oval on Wednesday.